Over the years, I’ve written about a lot of weird stuff for this blog; ghosts, Fiji Mermaids, Thomas Edison allegedly talking to the dead, etc., etc. I guess there are a lot of weirdos like me out there, because the number of daily visits to my site from new people is quite impressive…and for that, I thank you. But far and away, the #1 search term that brings people here to my site is “Tokoloshe”. For the uninitiated, the Tokoloshe is a bizarre creature that appears to be a cross between a monkey and a gnome. 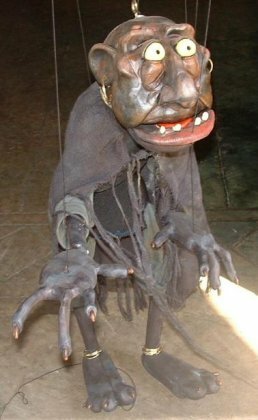 Originally found only in African folklore, the Tokoloshe could be summoned and called upon to do everything from frighten children into behaving to generally making a mess of their victim’s life. Recently, there have been a rash of reports claiming that reports of Tokoloshe activity have not only increased, but has also spread outside of Africa whose attacks often appear to be sexually motivated. I first covered the Tokoloshe in a July 2011 post, which, to be honest, was the result of a conversation I had with a co-worker/friend about how strange it was that some people believed in the creature. As the number of hits on my blog via Google searches for “tokoloshe” began to steadily climb, I quickly discovered that many people across the world do indeed believe such a creature exists. In fact, Tokoloshe sightings are becoming more and more commonplace…and bizarre. Now, you can own your very own Tokoloshe puppet. Great for terrorizing neighborhood children and adults alike! And the weirdness doesn’t end there. The villagers have become so desperate to rid themselves of the Tokoloshe that they have resorted to contacting local “prophets”, asking them to exorcise the monster. However, the prophets’ asking price for such a job is way beyond the reach of this poverty-striken village. So for now, it appears as though the Tokoloshe is still free to roam through the village, apparently assaulting women at will. You can view the full Informante article here.